Bean’re is one of the last American Nomads. He makes his own rules and travels to and from on his own schedule. The to and from usually involves motorcycle events, like Sturgis and Daytona. His mode of travel is a very-well worn Harley-Davidson with over 200,000 miles on the odometer. With his long pony-tail and tall top hat, Bean’re looks like the original drug fiend. It turns out, however, that Bean’re is straight and sober, and has been for over 23 years. 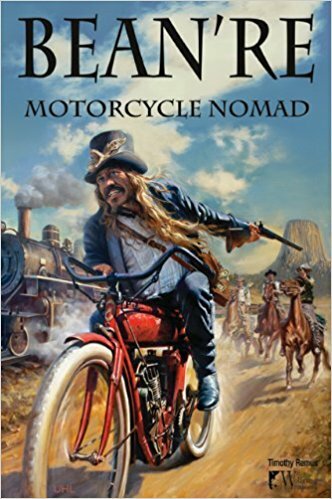 Bean’re: Motorcycle Nomad is both a non-fiction story of a life-long adventure and an inspirational tale. If anyone in this world is free, truly free, that someone is Bean’re. Free from the 40-hour grind. Free from the credit card bills and mortgage payments that dog the rest of us. Free from dependence on drugs and alcohol. In addition to travel tales and testimonials, this new book includes tips on everything from breaking free of the daily grind, to learning how to live without chemicals. There’s a chapter on Bean’re’s motorcycle travel tips: How to pack light, pass up the motels, keep an old bike on the road, and deal with the inevitable hassle of storms and breakdowns.